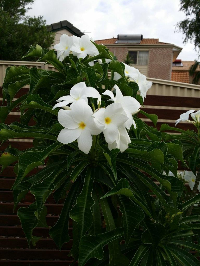 Hi Geoff, It could be a white Mandevilla. Google this and check some of the pictures. Maybe also check Plumeria (frangipani)? Hi Pam, I thought when I saw the flower it was of the Mandevilla family( I have the pink) but it is not a creeper type plant but an actual "bush"..The picture I posted is a tad dark and does not show the leaves very well.Also the flowers are grouped together in clumps. I will have to pop a letter in their letter box and ask them. Hi Marilyn, ummm, when you see the bush, it is not a Plumeria. In the streets about our home, there are many Plumeria in flower now of all colours. Also, the branches are quite spindly and not solid like Plumeria. When i get more information, I will report back. OK, and the winner is....Marilyn....My wife found it from lots of google research on the web. It is a Plumeria Pudica, or fiddle leaf pudica. Very different to normal Frangipani with small thin branches see..http://www.stgmagazine.com.au/community/2011/03/23/bridal-bouquet-frangipani/ Apparently though, it, like all Plumeria hates wet feet. Some 500mm down, we have 10+ metres of pottery grade clay conditions. (house is on screw foundations) so, even though I can build up the ground, sooner or later, its roots are going to find the clay.may have to rethink this plant?? Glad you found out what it is. It looks very different, and I had never heard of Plumeria pudica before - will have to check it out in tropical nurseries. Comment on "Bright white flower on bush"